Brazilian Drinks - What Are the 5 Most Popular? 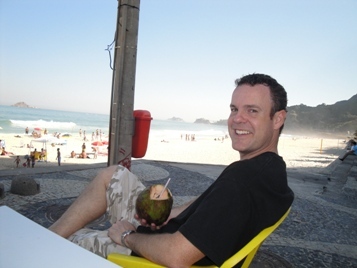 Here's 5 very popular Brazilian drinks I discovered when I lived in Brazil. 1. Coconut - You may have seen people drinking from a round green object with a straw and wondered what in the world it is. Where I'm from in Alabama, the only coconuts we see are brown in the grocery store. You'll see these sold in the kiosks by the beach. They're sold ice cold and then they cut off the top and give you a straw. Honestly I didn't like it at first but the more I tried the more I liked it. Especially on hot days in Rio, that cold coconut drink hit the spot. 2. Acai - This is another pretty good drink. Its actually more of a slush but its really good. Its not too sweet and is just plain good. It comes from the acai berry and there's nothing like it in the US. If you can get it with granola on top, you definitely need to do it. Make sure you clean your face afterward or you may have purple residue on your face. Just saying. 3. Guarana Antartica - This is a popular soft drink. Gurana is a fruit and they do have a guarana drink that is not carbonated but its not as popular. If you say you want Guarana at a restaurant they'll bring you an Antartica. It's hard to explain but its kind of sweet but not overbearing. I don't drink carbonated drinks very often but I drank these a lot. 4. Caipirinha - This is probably the most popular alcoholic drink you'll find in Brazil. I'm not a drinker really but people I know would drink these a lot. Its made with cachaça, sugar, lime and crushed ice. Cachaça is a type of liquor that comes from fermented sugar cane. 5. Brazilian Coffee - Brazilians love their coffee. Even though I'm not much of a coffee drinker I felt obligated to drink it while I lived in Brazil. They don't like coffee from the US very much. They like their coffee better because it is typically in a smaller amount and much stronger. Almost like a shot of espresso. If you're not much of a coffee drinker like me, enough milk and sugar will make any coffee good. If you get a chance to visit and experience the Brazil culture, you need to try these 5 Brazilian drinks for sure. Even if you don't like them all, life is all about experimenting and doing new things.